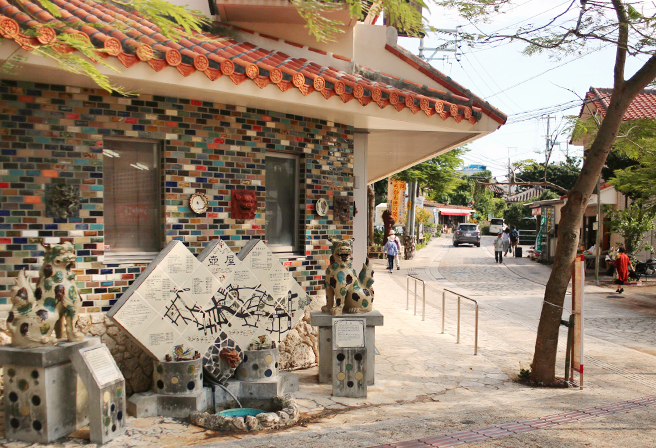 Many people collect pottery from different areas as a hobby, and even those who do not will still want to visit Yomitan Pottery Village, the home of Yachimun pottery, as well as Tsuboya Yachimun Dori which can be found just around the corner from Naha’s Kokusai Dori. The designs are often based on the various patterns and colors of the diverse nature that can be found in Okinawa, such as plants and fish, and they have a rustic feel to them so that the warmth of Okinawa can be felt from anywhere. Tsuboya Yachimun Dori has been around since the 17th Century, and with its stone walls and pavements, it retains the charms of an Okinawa from long ago. If you have half an hour spare, there is a small road you can walk down with lots of pottery workshops and stores lined up one after the other. If you look carefully, then no matter how much time you have to spare, it won’t be enough. From traditional items to more modern ones made by young craftsmen, you will surely find a product you like. Every year in Autumn, crowds of people come for the Tsuboya Yachimun Dori Festival. During the festival, dishes are sold at a reduced price and visitors can experience making their own piece of pottery. There is also a traditional dance performance put on by locals. 20 minutes by car from Naha airport.